The sun is finally here. I’m not sure if it plans on sticking around, unlikely given that it is only March, but I will take it. I even got to wear sunglasses yesterday on my long run. Afterward I sat in the dining room and revised for my exam – which is in a week. We still needed the heating on in the house, but I sat in the sun next to the radiator and read until my head was going to explode with insurance information. It was lovely and warm and made me long for flip flops and iced coffee. Summer is a long way off, but there is a glimmer of hope out there right now. Who knew this southern Californian would ever get so excited about 8 degrees Celsius. I feel like breakfast in the summer house can’t be long off now. I have a slight serious breakfast and brunch obsession. I don’t understand people who don’t eat or don’t like breakfast. 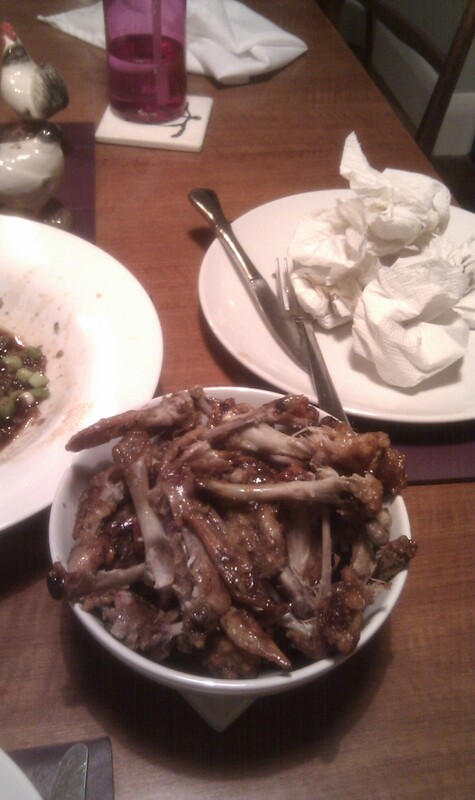 Seriously, how can you not like a meal? And I really struggle to understand why you would choose to eat cereal on a day when you have the time to make something else. If I am running for less than an hour, I might not eat till after I run, but skipping breakfast really has never occurred to me. Ever. I don’t feel like I have had breakfast on the weekend if I don’t get to eat eggs. Post run fuel on Saturday was a breakfast quesadilla, coffee and a milk, banana and almond butter milkshake. How could you not like that? 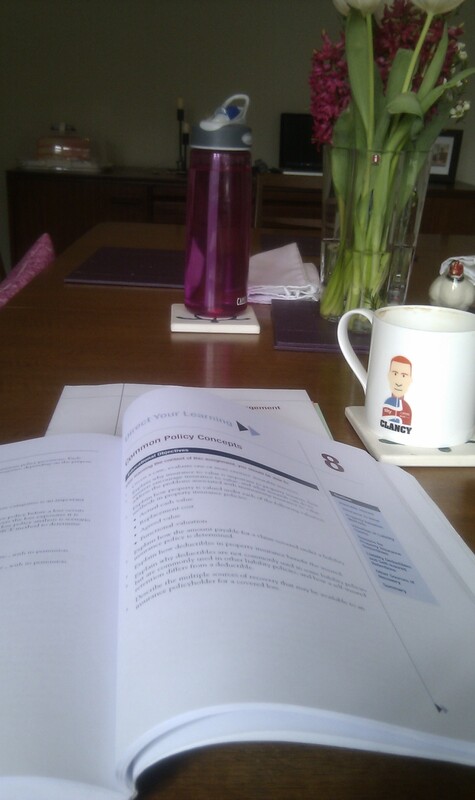 Most of the weekend was spent revising – boring. We did go out to lunch and then to the movies on Saturday afternoon to see Song for Marion. I think that the whole theatre balled from the start to finish. Yes it was a little cheesy but it was also incredibly sweet and touching. I did 9 miles on Sunday morning followed by coffee and toast with two eggs – sunnyside up of course! I have seen several Virtual Coffee Dates and I really like the idea. I mean who doesn’t love a coffee date ? Mine always involve a large flat white (or a latte if I am back in the US), cake and a lot of laughing. My choice today is a Taylor Street skinny flat white. Full caffeine, which is a special treat these days. I love going in there because the staff are so friendly and always seem to be having a great time at work. So here we go, our first coffee date…. If we were having coffee right now, I’d tell you that I am loving my running. In an obsessive type of way. I read loads of running blogs, I think about what runs I am going to do, what new running clothes I need (okay, want, but what’s the difference) and can’t wait to look at all my stats on Strava as soon as I have finished. I am loving my Monday night runs with Alice and my long runs on the weekend mornings. I love seeing and feeling my progress. And our bank lady told me I look like I have lost weight, which is fantastic! If we were having coffee right now, I’d tell you I have to go for a scan tomorrow. It sort of freaks me out and I am not looking forward to it but am hopeful that they will tell me everything is fine. I think everything is done there and then, which means hours at the hospital but it eliminates the weeks of waiting for results. Medical ailments are never fun and sometimes I feel a bit like the GP’s guinea pig. If we were having coffee right now, you’d know how excited I am about my 2nd successful 5:45am wakeup call. I needed to find more hours in my day as we were having dinner at almost 9pm on the nights I was going to Pilates. Those classes help me feel like me but late night dinners just don’t work. So I moved my class to the morning. I drive to the station a few miles from my house because the train times work better. I don’t like driving to the station but it is the only way to make the morning class without getting to the city an hour before it starts. And it is working so far. I have felt more energized throughout the day than I usually do with more sleep. AM workouts work! Now I just need to add in a morning run and try to stay awake past 9:30pm. If we were having coffee right now, I’d tell you that I am bad at microwaving. I didn’t even know this was something you could be bad at! We don’t a microwave and at home I don’t ever have a need for it, but it is useful to have one at work – if you can work it… Certainly you just turn it on and it does it all for you, or not as the case may be. Last week I exploded my oatmeal all over the microwave in the kitchen at work. Not one oat was left in the pot and it took me 15 minutes to clean it up including off of the roof of the microwave. And I had no breakfast. This morning I only lost half of it and luckily it just bubbled over so I only had to clean the tray. I had a small victory with my soup for lunch but I stopped and stirred it every 30 seconds. I really hope you have a lovely day. I meant to buy some new shoes on Tuesday before I went to see Chris Finill speak about his Run Across America at Run and Become. But I got out of work late and didn’t have enough time before the talk to actually buy the shoes. With Friday off I thought I’d head back in to the city for a little shopping. As always, excellent service and advice from Run and Become. I passed on the newest version since these were about half the price and slightly less ugly. And now that I have put them on Strava, I will be able to truly track the miles I have done in them instead of guessing when I hit 300 miles. When I was younger, I always thought my new shoes would make me faster. I hope that these ones will work the same. 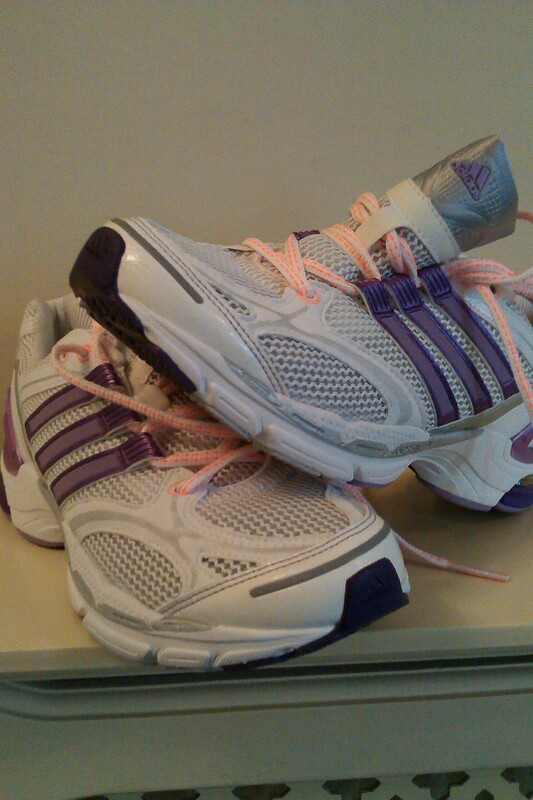 I did almost 8 miles on Friday morning, pre shoe shopping. It’s the longest I have done in ages and it felt great. I can feel myself getting faster on both my long and short runs and the few extra miles are getting easier. 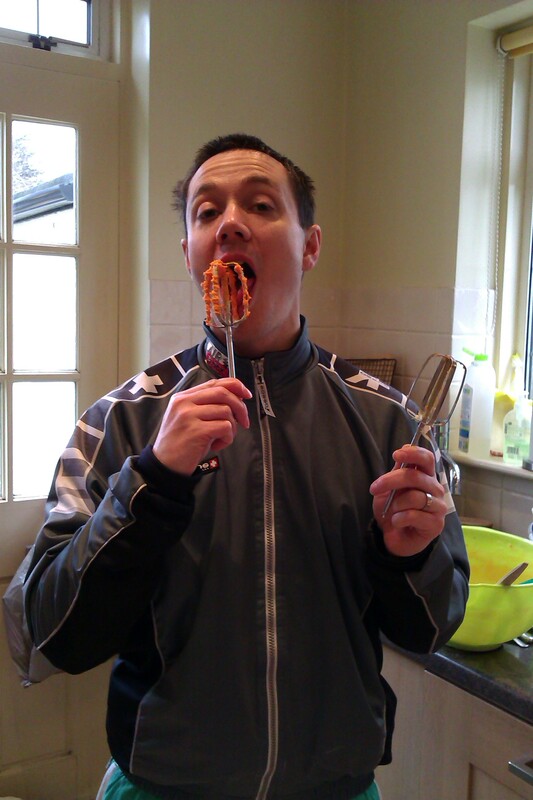 I am trying to work out my A and B goals for both the Sidcup 10 and the Paddock Wood Half Marathon. They are a month apart and I haven’t really got beyond April with what else I am going to do. I woke up early on Saturday and considered running parkrun but I couldn’t find my barcode. So I postponed my run till late morning and tried to bake my mother in law a birthday cake. It wasn’t a total disaster but it wasn’t great. 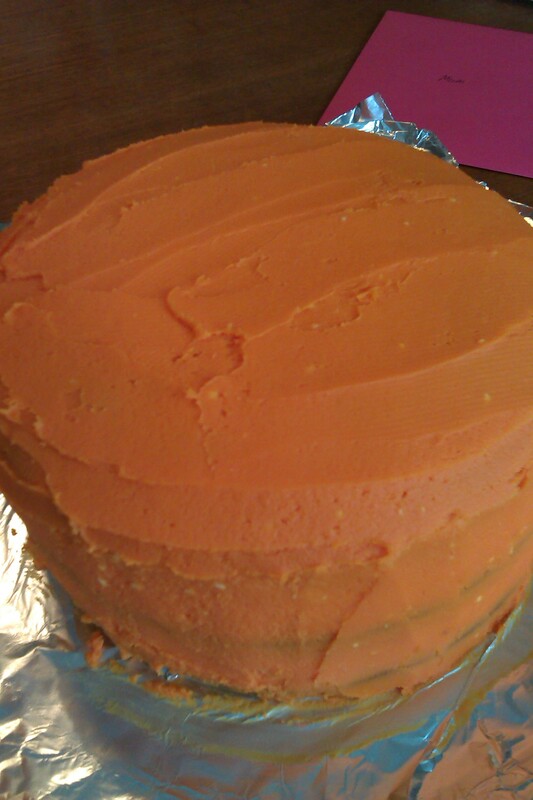 A little too dense and I managed to dye my frosting Halloween orange. 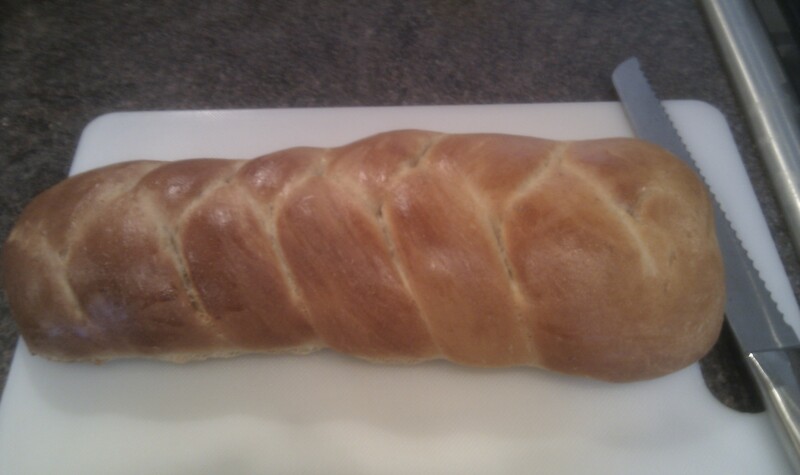 I’ve convinced myself that a KitchenAid might be the answer to some of my baking flops. Needs a little less food coloring and a lot more buttercream frosting. Saturday afternoon we had a late lunch at The River Cafe. Simply stunning food and location. I failed to take any photos but maybe I can use that as an excuse to go back. My mother in law was still raving about how great her birthday lunch was this morning. Jantastic is working wonders. I would have found an excuse not to run this weekend because we had friends and family around. I needed to run both days to get to my four runs. Funny, you can find time if you try. Two great runs this weekend that I would have missed otherwise. My new shows must be working…. 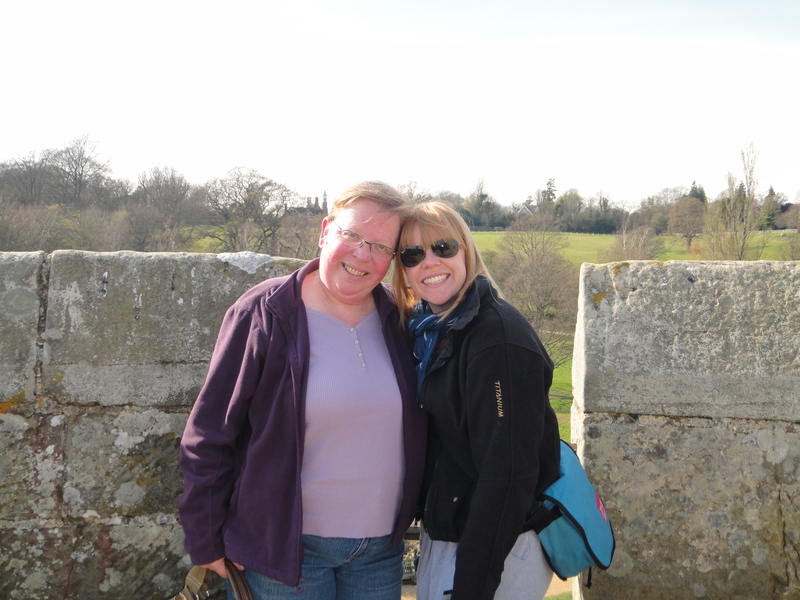 My mom made the passport leap last year and came out to visit in April. We had a lovely time and tried to avoid the sights that my dad will defiantly want to see. At Mompesson House. 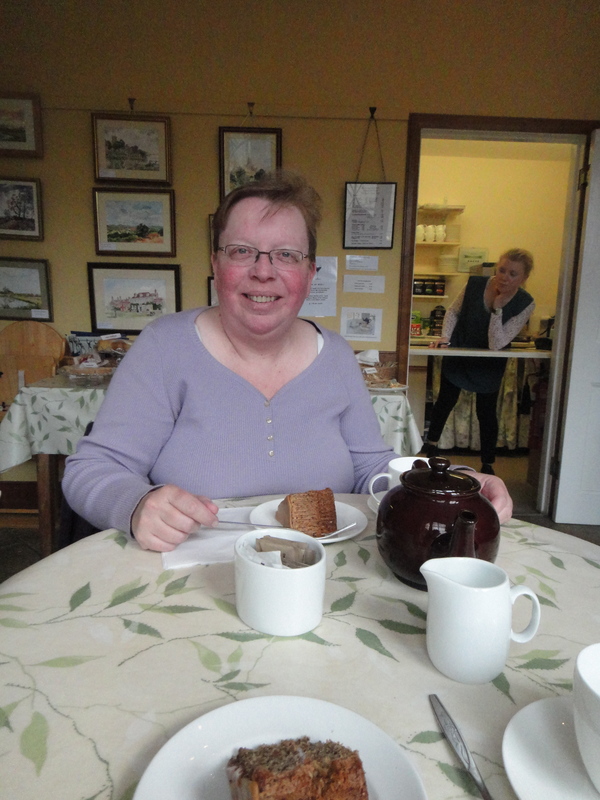 We had lots of tea and cakes at National Trust properties. They will be here for two weeks in the summer and I am already crossing my fingers and toes that we have good weather. Looking at my blog I need a new camera. Both on my phone and otherwise. My phone camera is blurry and my little handheld colors things in bright pink. So I will have to do my research and find a new camera. And this just might be the motivation to get an iPhone. I only just entered the smart phone world 4 months ago when David upgraded and I took his hand-me-down HTC. Unfortunately neither will happen any time soon as our living room still isn’t fully furnished. 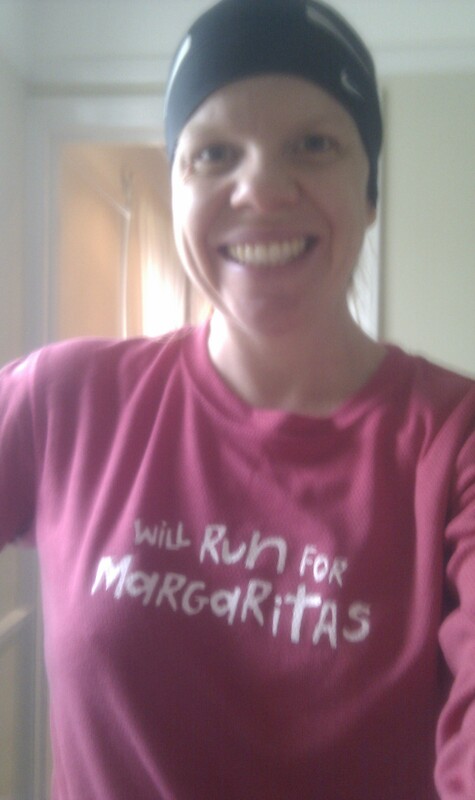 Running went will last week and I managed to exceed my Jantastic goal. I did just over 7 miles on Sunday. It was bright and sunny. A stunning day to run and I even got to wear my new sunglasses with the dark lenses in them. And my hips have been feeling great. I have been rolling and stretching and using the Nike Training App on top of Beautcamp once a week. It all started because David is headed to the Alps this summer to ride and follow the tour. To make the mountains easier, he’s decided he wants to lose a little weight. Mainly because “once you hit 30, you have to work at not being fat.” For the record, my husband is a far cry from fat in the first place. But I am not going to prevent him from eating healthier. Especially when it means he’s making us salads for lunch every day and moaning less about eating vegetables with dinner. 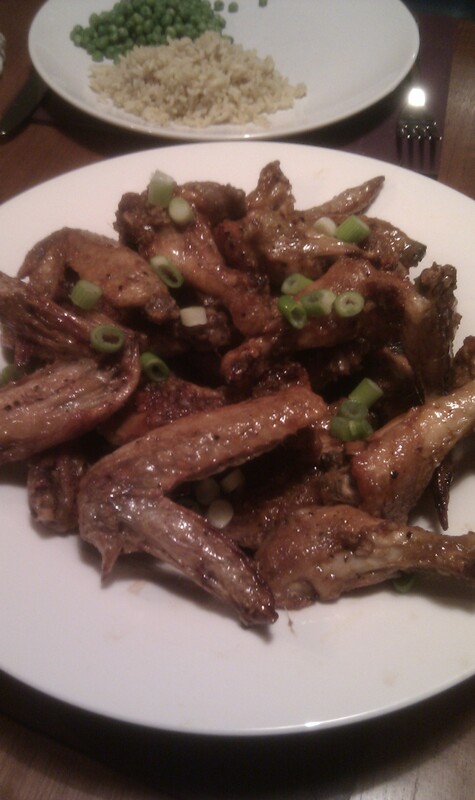 Tonight we decided to make up for our lack of SuperBowl chicken wings with these Spicy Baked Chicken Wings that will Rock Your World. I think we rocked them! Sunday morning I arrived in Cape Town for a work conference. While I have had long days and late nights, I have also had amazing weather, wonderful food and beautiful runs along the ocean. Cape Town reminds me a little of a California beach town. And being here reminds me what a great job I have. So when I am back in London, stuck at my desk and freezing cold I will remember these 5 days and remind myself that this job allows to do some pretty amazing things. Business lunch. I have a hard job…. I had a free day on Thursday and I had to check out of my hotel. 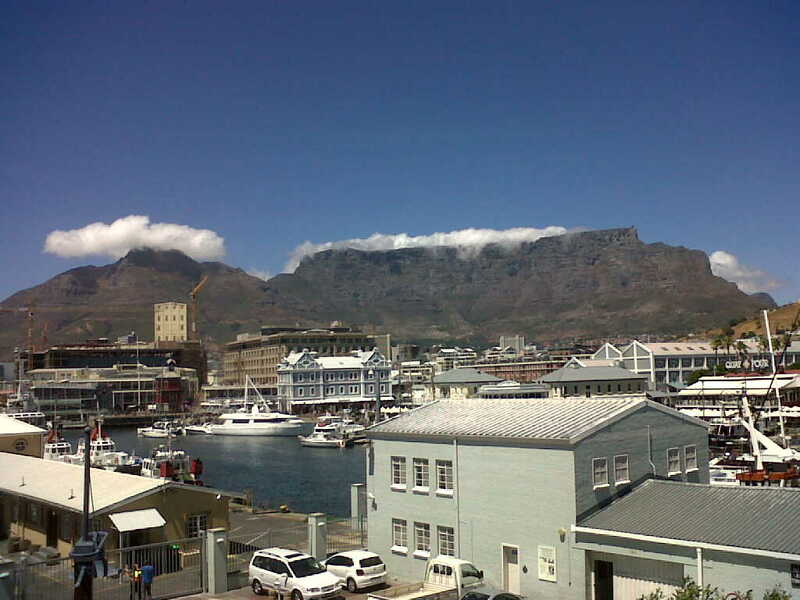 So I took a guided tour of the Cape Peninsula with African Eagle. I was the last one to be picked up and got to sit in the passenger seat of the van. I know all the cool kids sit in the back, but it’s not so cool sitting in the back if you get car sick. Plus, the views are always so much better when you sit in the front! 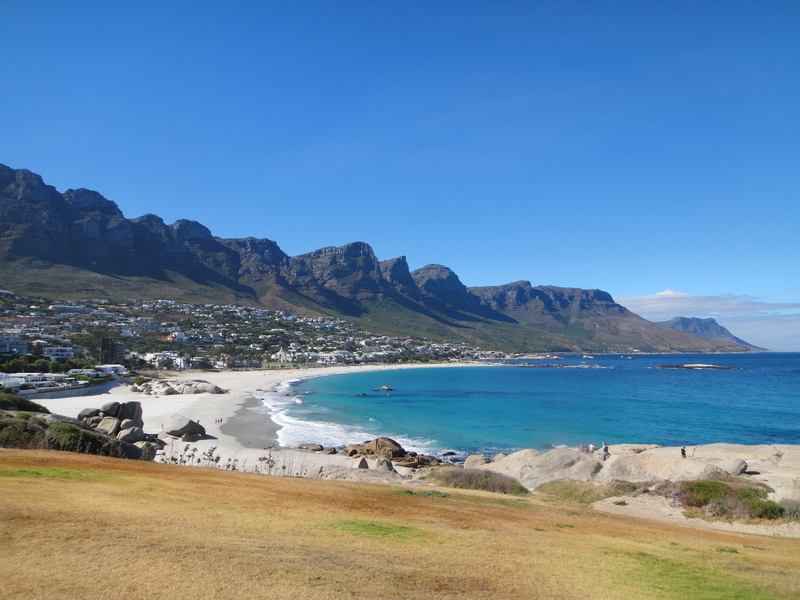 It took about 3 hours including breathtaking stops along Chapman’s Peak Drive to get to Cape Peninsula National Park. We went on a short seal watching boat trip in Hout Bay. It was nice to be out on the water. The Cape Peninsula National Park is home to Cape Point and the Cape of Good Hope. I grew up learning about Dias and da Gama sailing around the Cape of Good Hope in their tall ships. 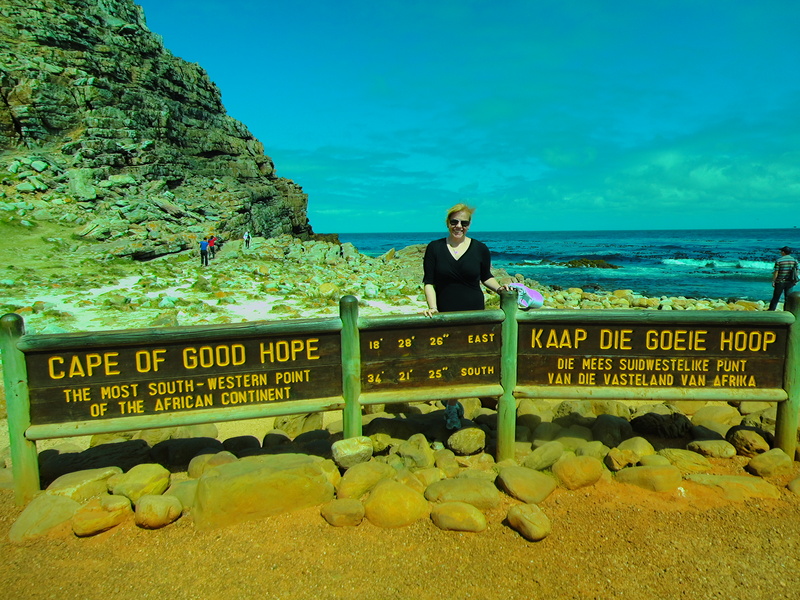 The Cape of Good Hope is often mistaken for the southern most point in Africa. 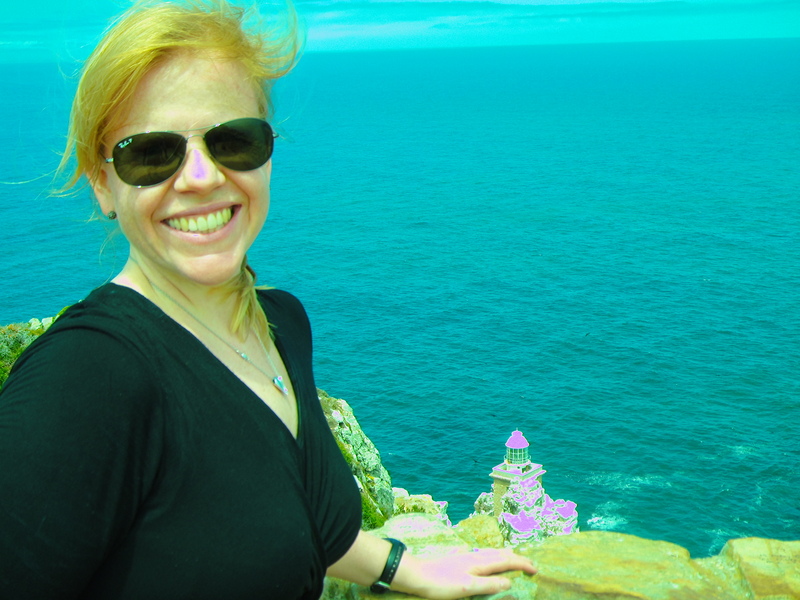 We were given 45 minutes after lunch to explore Cape Point. I joined the German couple who were a part of our tour and power hiked as close to the point as you are allowed to go! They were the friendliest people on our tour and it turns out they were fellow runners who had lived in DC in the 80’s. I’m not wearing zinc. I think I have dropped our little camera one too many times and now half my pictures have pink highlights. 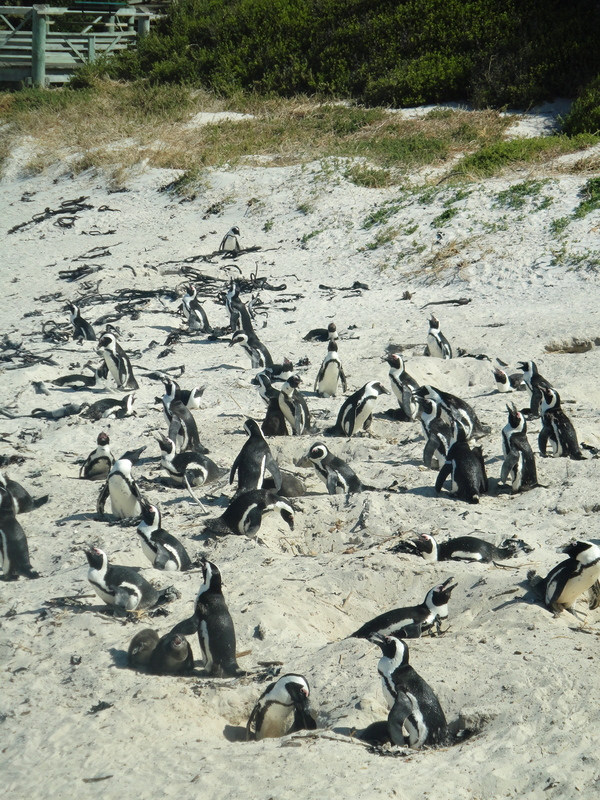 After being in the sun for so long, I was happy to get back in to the van for the drive to the penguin colony at Boulders in Simons Town. They are now called African Penguins, which is more tourist friendly than the local name of Jackass Penguins because they sound like donkeys. There were hundreds of them sitting on their nests and sunning themselves. We finished the day wandering around Kirstenbosch National Botanical Garden. Kirstenbosch was stunning and I wish I had more time there. 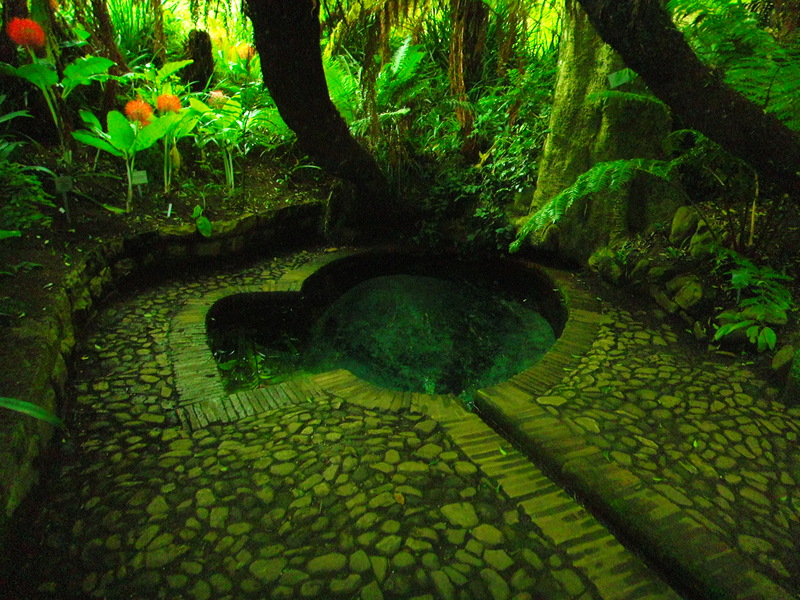 Our guide took us to his favorite place in the gardens up a darkened path along a natural spring. We finished up a herb garden where you were encouraged to touch and smell everything in the garden so that you could experience all the smells – good and bad. Luckily, our guide pointed out the nicest ones. I left Cape Town and the glorious sun and landed the following day back home where the high was 2. Five stunning days.